The fifth in a series of transcriptions of my experiences traveling with my wife and her family in Italy. The originals were scribbled on whatever pieces of paper were handy and are presented here unedited. 29 Mar 2002: Lisa’s dad has decided to take the day off; he will remain behind in Positano while we take the boat to Capri. A wise choice, it turns out, given the amount of wind and rough water we face in the next hour. Capri is as beautiful as I remember it, though colder. We start in the town of Anacapri, which is smaller than the main town, tourists everywhere, fewer stores. 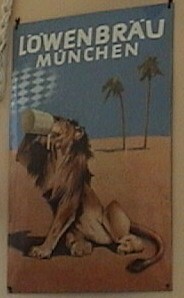 A poster on the wall of a store shows an unusual lion and a little less high-brow style than is normal on the other side of the island. The other side of the island: expensive pottery, good food, limoncello. Sitting in a café it occurs to me that I enjoyed the island more when I was able to hike around it on the previous visit and get away from the pottery, food, limoncello, and cafés. That night in Positano, we try to go to a restaurant I remember on the cliff path above the town. But our early dinner plans don’t fit the Positano lifestyle and we return to La Cambusa. The food is still excellent… and the staff seem actually happy to see us. Currently playing song: “Rock and Roll” by Velvet Underground on Loaded.